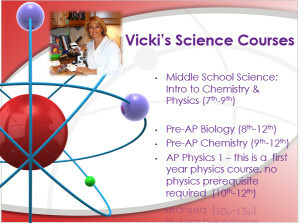 Looking for Online Science Classes? If you’re looking for an academic and lively alternative to your home school science program, then check out my science courses. With a combination of recorded lectures, lively discussions, and detailed teacher feedback these courses will help your student succeed and enjoy science! You can download some informational sheets from this website or you can message me any questions. I’d love to hear from you! And as of this fall (2014) my physics course will be aligned with the new AP Physics 1 exam. So for any students interested in taking that course in May of 2015, I will help them to prepare for the exam. Prerequisites for the course and the AP Physics 1 exam are successful completion of Algebra 1 and Geometry. Algebra II taken concurrently is acceptable. No prior physics is required.